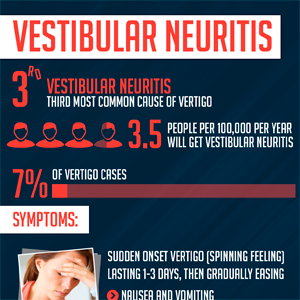 Vestibular neuritis is the third most common cause of vertigo. We often see it and its consequences in our vertigo and dizziness practice. To raise awareness of this condition we have created this infographic. You are welcome to use this infographic on your site, provided you follow the directions below. Use This Infographic on Your Site! You may use the graphic above on your site, however, the license we grant to you requires that you properly and correctly attribute the work to us with a link back to our website by using the following embed code. Copy and paste the code below to use this infographic on your website. Eastern Brain Centre, focusing on treatment of vertigo, click here to view the original.